Twister TFPL Blade Model TFPL1082 8 x 20 ft. Table - G & W Machinery Sales, Inc. 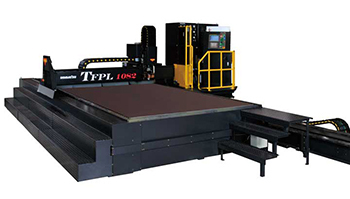 The TFPL Blade machines have the 525 Amp (100 kw) Fine Plasma Modular Power Supply and Torch on a range of table sizes with large cutting areas. TheTwister TFP3062 is a compact 6 x 12 ft. machine with a 150Amp (30kw) torch, or power up to the Twister TFP6062 with the 300Amp (60kw) torch. TheTFP3051 is similar in design 5 x 10 ft. table. If you need other table sizes or power requirements, check out the Twister TFPL Series featuring table widths of 8 or 10 feet, in 20 or 40 foot lengths, with either the 30 kW or 100 kW (525 Amp) Fine Plasma torch. Specification is in metric units. Units in inches are approximate. Technology in the Twister TFP3051, TFP3062, TFP6062, and TFPL Series is protected by US Patents, and other Patents Pending.